The link between drought and the rise and fall of Egypt's ancient cultures, including the pyramid builders, has long fascinated scientists and historians. Now, they're looking into an unexpected source to find connections: mummy teeth. A chemical analysis of teeth enamel from Egyptian mummies reveals the Nile Valley grew increasingly arid from 5,500 to 1,500 B.C., the period including the growth and flourishing of ancient Egyptian civilization. "Egyptian civilization was remarkable in its long-term stability despite a strong environmental pressure — increasing aridity — that most likely put constraints on the development of resources linked to agriculture and cattle breeding," said senior study author Christophe Lecuyer, a geochemist at the University of Lyon in France. Many studies have linked dramatic droughts to crises near the end of the Old Kingdom (the Age of the Pyramids) in the third millennium B.C. But Lecuyer and his colleagues also found a jump in aridity before the downfall of Egypt in the 6th century B.C. during the Late Period, when it was conquered by Alexander the Great. However, the new study can't resolve the occasional drops in annual Nile River floods or short-term droughts that often caused widespread famine and upsets in Egyptian history. "Our database cannot identify short-term events, only long-term trends, and there is [only] one obvious major event of increasing aridity that took place before the Late Period," Lecuyer said. The climate data comes from the teeth of Egyptian mummies from various dynasties at the Musée des Confluences de Lyon in France. Led by graduate student Alexandra Touzeau,the researchers drilled small amounts of enamel off some of the teeth and tested it for oxygen and strontium isotopes. 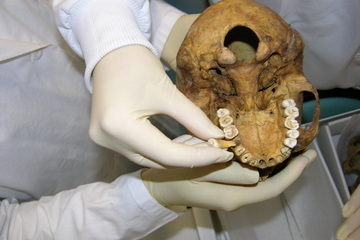 The mummy's teeth record the ratio of two oxygen isotopes (oxygen atoms with different numbers of neutrons) in their diet and their drinking water, which in this case is Nile River water, Lecuyer said. Shifts in the ratio of the isotopes indicate changing precipitation patterns in the region. The isotopes can also indicate what people were eating, and the research team plans to publish additional studies of Egyptian diets through time, Lecuyer said. "The general drying trend had no negative impact on the Egyptian civilization in terms of cereal production or population," he said. "One of the studies we plan to publish soon reveals there was no diet change over this long period of about four millennia." The Nile Valley wasn't the only part of North Africa to experience drying after 5,500 B.C. The Sahara Desert was once covered in lakes and grasslands, but switched to a drier regime between about 7,000 to 5,000 years ago, studies have shown. The mummy teeth findings were published June 2 in the journal Earth and Planetary Science Letters.